In my first activity with my new group coordinator hat on, today I took a new volunteer ranger out on a ride over the part of Route 13 that he’ll be looking after. 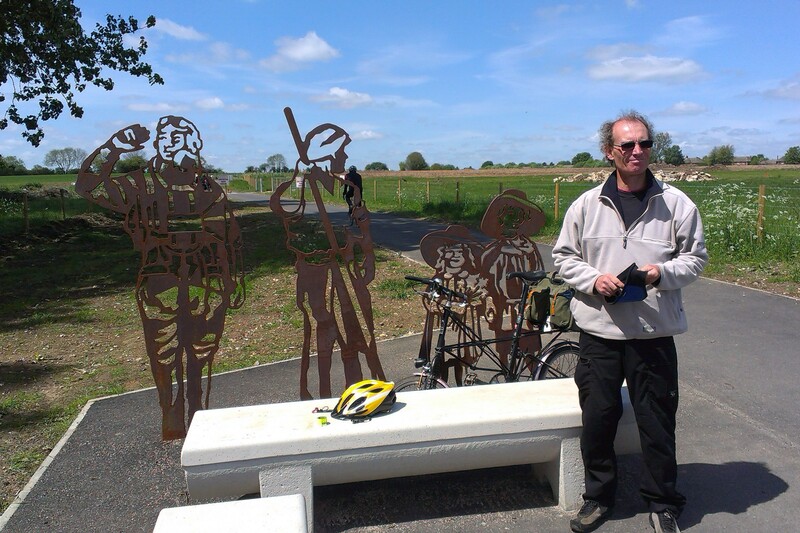 I took the train to Attleborough, and then cycled to meet the new ranger at Hingham. We then rode north to Daffy Green to the start of his section of the route, and followed it south to Watton. From there we took the new Watton–Griston cycle path (stopping for lunch at the Portrait Bench) before re-joining route 13 at Thompson. 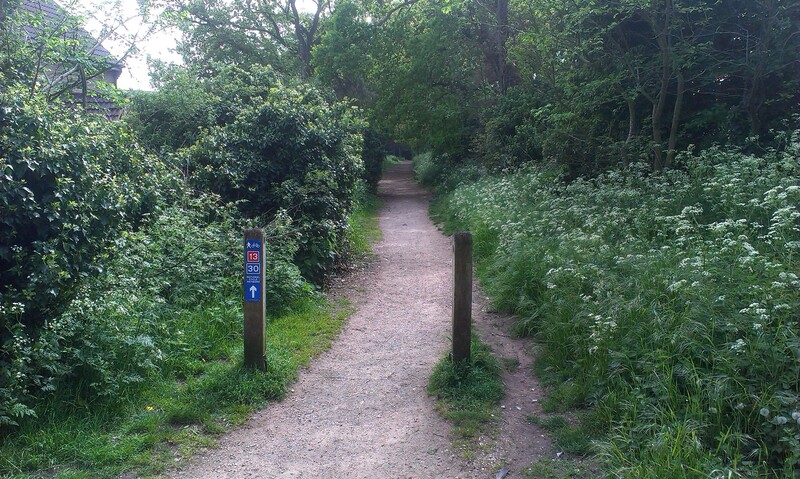 We followed the route to Stonebridge (the end of his section) and I continued alone back to Thetford, still on Route 13. In general, the route was already well signed with permanent council signs at all the junctions and turns. However a few extra conformation signs in the longer gaps between these signs would be useful. We were did a couple of bits of work ourselves. 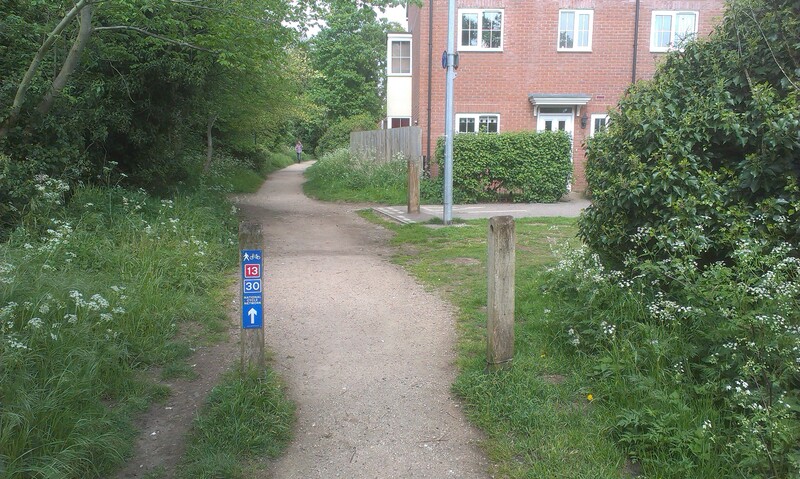 First, a pair of permanent signs in Bradenham were both 180 degrees out, and so pointing riders in the wrong directions. Using an adjustable spanner, we managed to rotate them round to the right positions. We also cut back some of the overgrowth that was obscuring the signs. 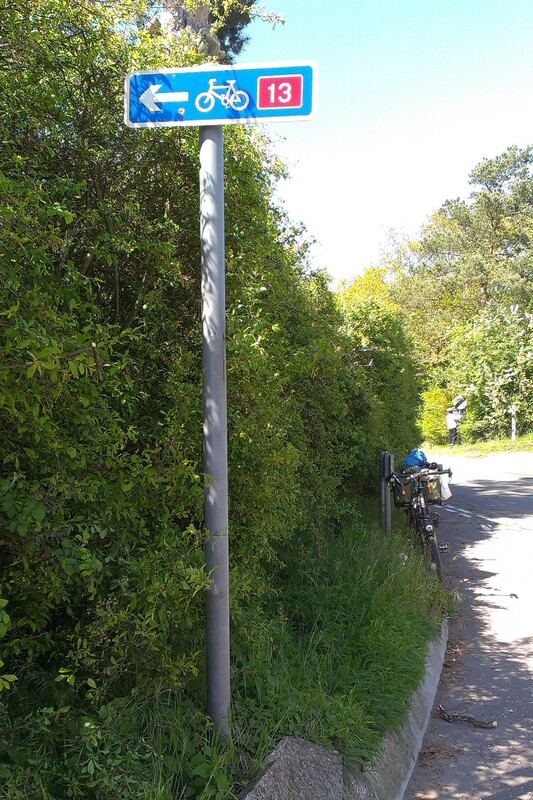 Secondly, in Stonebridge, we moved a permanent sign from one side of the road to the other since it was obscured by a telegraph pole where it was originally, and also cut back some of the hedge around a second sign. Is there a reason why the permanent signs at the junction of Ploughboy Lane and Chequers Lane at Saham Tony comprise just a small 13 on a red background, rather than the usual blue cycleway signs? 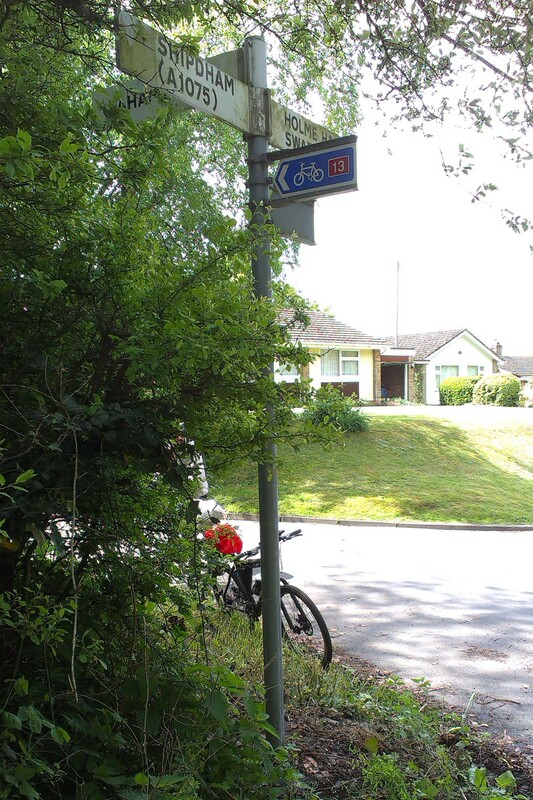 Should there be better signage to link the Watton–Griston Cycle Path back to route 13 in Watton? Is there a reason why the route south from Thompson diverts west along Tottingham Road to join the Peddars’ Way further north, rather than taking the more direct route which is mostly along a metalled road? Better signage is needed at the junction of Tottingham Road and the Peddars’ Way. The condition of the surface on the middle section of the Peddars’ Way. Admittedly it had rained heavily for the previous couple of days, but the undulating surface lead to large pools of water, which spanned the whole width at a couple of points. 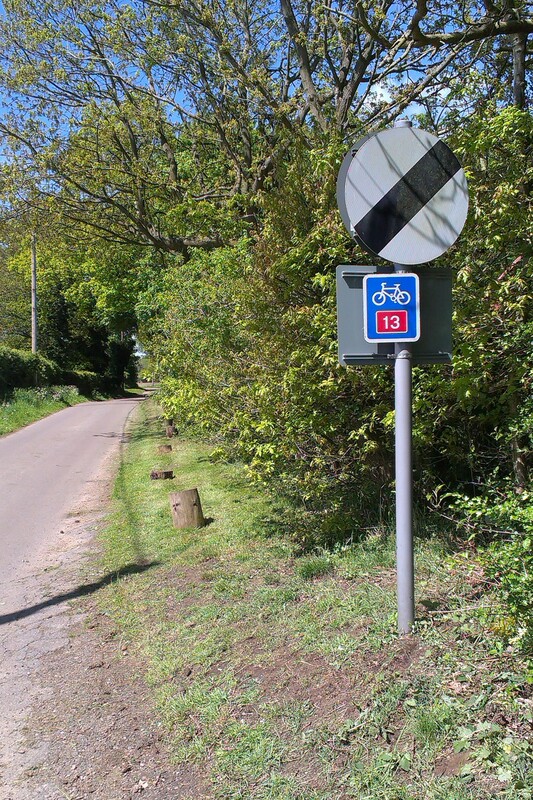 What is rationale behind the new-looking “(13)” link sign that points off the Peddars’ Way at Galley Hill along the road towards Great Hockham? Recruiting and welcoming new volunteers to the group. 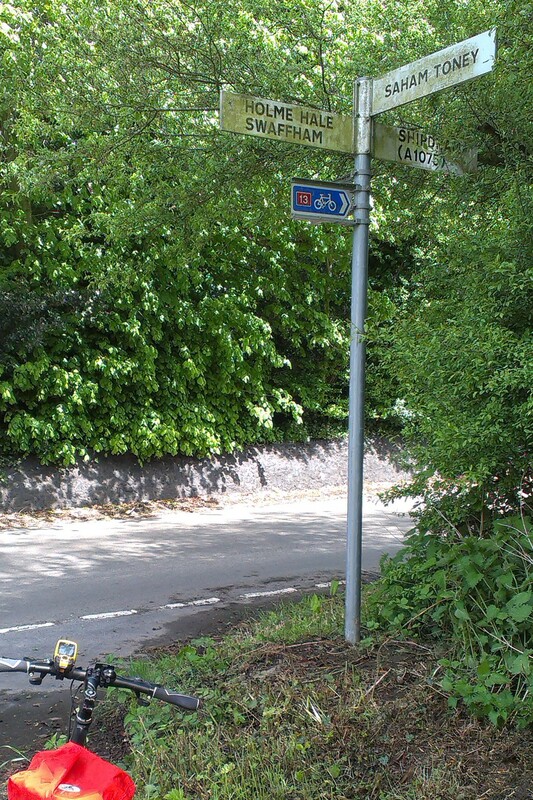 Today, I finally got around to putting up two additional confirmation signs on Green Lane in Thetford. These were rigid plastic signs, nailed to two convenient wooden posts.